The XV104 Riptide is the latest Battlesuit to have been developed by the Earth caste. 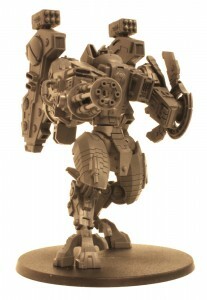 It stands twice as tall as the XV8 Crisis Suit but retains the fluidity of movement typical of all Tau Battlesuits. It is always nice to tackle a larger kit from time to time as there is often much less fiddling with smaller pieces involved in the build. Construction of this kit should be a lot easier than many kits, especially for those of us who are not blessed with slender fingers. In fact it turns out that the Riptide kit is so simple to build that there is little to mention in the construction part of this review, certainly there is little to criticise. The instructions are clear and parts fit together with little fuss. One feature of the build to note however, the Riptide has “location pins” on the hip joint of the legs which hold the legs in the default pose, but these can be snipped off, freeing the ball joint and making a greater range of poses possible. This is a great idea – for a quick and easy build use the pins – to build something a little more unique, snip them off. The knees and ankles also have some movement complementing this flexibility at the hip. The arms are basically ball sockets also allowing a wide range of positioning. The Smart Missile System, Fusion Blasters & Plasma Rifles, the additional weapon systems, could be easily magnetised to allow weapon swapping. The main weapon, either Heavy Burst Cannon or Ion Accelerator, also looks magnetisable as they attach underneath the arm, but there is a small pipe that runs between the weapon and arm that might make this slightly tricky. However this can either be left off or could potentially be pinned or magnetised separately if desired. Visually, I have to say I’m undecided on the Riptide. Some of the weapon options look like after thoughts rather than parts of the kit – specifically the Fusion Blasters / Plasma Rifles than can replace the default Smart Missile System. Also the head is out of proportion with the rest of the Battlesuit – I know what the designers were doing here, they were thinking “It is simply a group of sensors so why should it be bigger on a bigger suit” and this is only a personal gripe, but it does look odd / unbalanced. Lastly, value for money, at £50 RRP the Riptide represents reasonable value for money, for a Games Workshop kit. 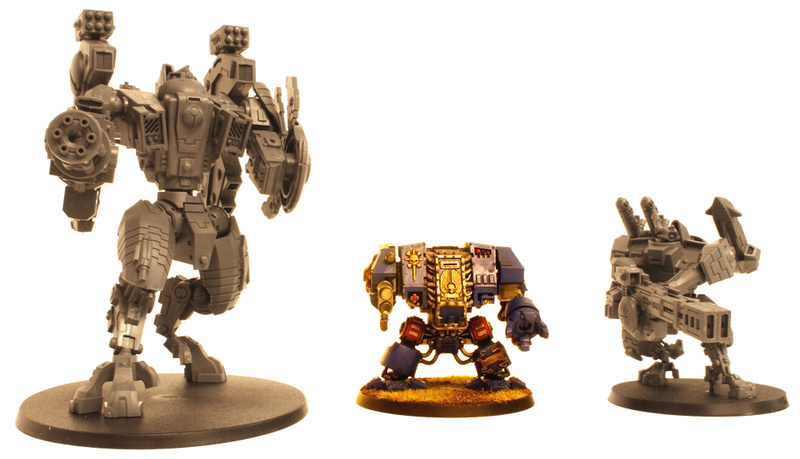 Looking at it compared to the Slaughterbrute we reviewed a couple of months ago it is a much more substantial model at the same price point, whilst compared to the Broadside we reviewed yesterday it is at least double the size for less than double the price. The Tau XV104 Riptide kit is a pleasure to build and contains parts for all of the various options that are included in the Tau codex. The kit is highly pose-able and lends itself to magnetisation/weapon swapping, so you are not stuck with only a single build. Visually it is not my favourite model from the new release but that is just down to person taste. All in all a very nice kit indeed! 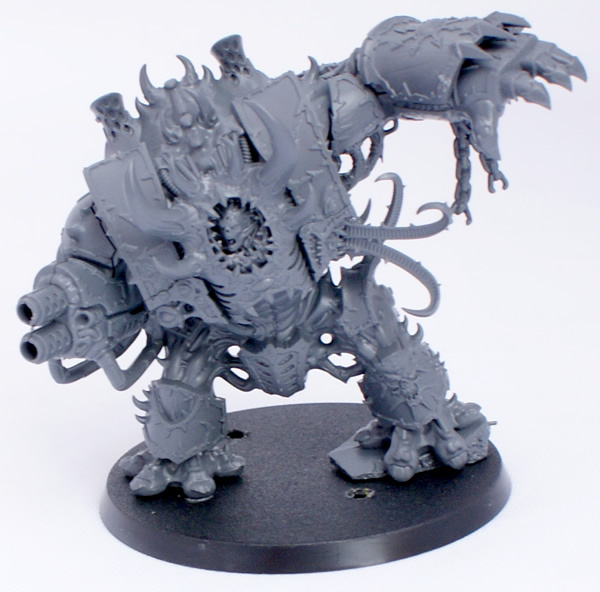 The Slaughterbrute is the largest kit in the new Warriors of Chaos release. 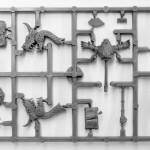 It is a multi-part plastic kit including 78 parts with which it is possible to build either a Slaughterbrute or a Mutalith Vortex Beast. A Slaughterbrute is a huge vicious muscle bound monster, while the Mutalith Vortex Beast is a terrifying fusion of monster and magic, a creature mutated beyond all reason by the power of Chaos. Looking at the box this is one cool looking beast! 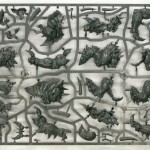 Contained within the Slaughterbrute box are two sprues & a 50mm x 100mm monster base. On inspecting the sprues the model initially looks quite difficult to build, a feeling that is re-enforced by the 24 page instruction booklet. After an easy start, putting the legs together, it seems this initial impression was correct. The body must be built in a very specific order, otherwise the various parts will not fit together properly. Now this is not necessarily a bad thing as it allows for a very neat looking result, no obvious ball joints or similar from some older kits, but it does mean that following the instruction booklet is highly recommended. There are other features of the build that are also of note – the way the back ridge fits together for example, the join weaves between the spines avoiding running straight down the middle, this has the effect of concealing the join nicely. Also, the sprue join points are well placed and don’t interfere with assembly, nor do they occur on delicate parts overly much. 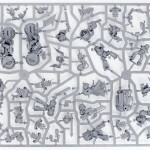 The sprues are well laid out with the body on one and the options and extras on the other . A side effect of all this complex build is that the model is not terribly poseable – that said it does include a huge number of options (more on this later). 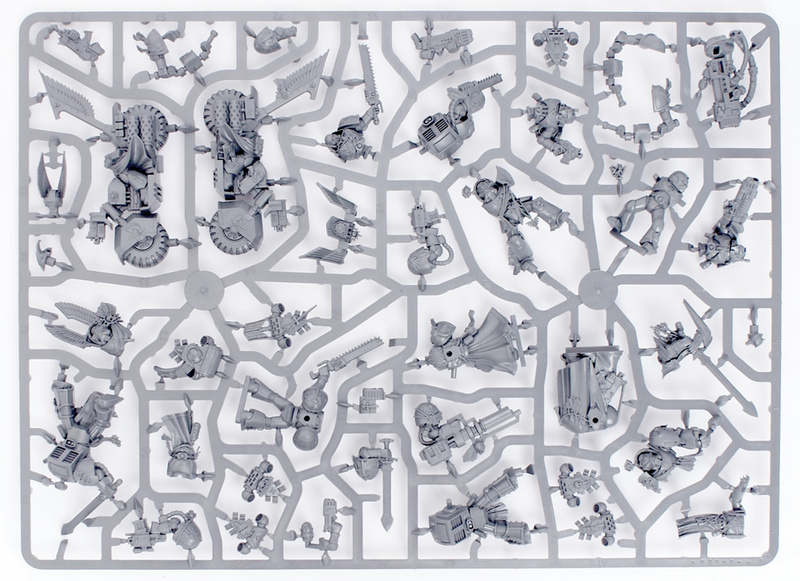 For all this complexity, it looks like it would be a doddle to build this model in such a way that it could be used as both monsters that can be built from this kit through magnetising the head and just slotting the alternate back mounted options in place, both can be completely built from the parts in a single kit. The way we have built the kit also leaves lots of tentacles left over, these make for a cool addition to any bits box. With regard to value for money – this is a pricey kit and although there is the option of getting two kits for the price of one through the use of interchangeable parts, £50 is a lot of money for a single plastic model. Only much larger Warhammer 40,000 vehicles are of comparable price – this is the most expense individual Warhammer Fantasy Battle model available. This is a fantastic looking model that comes supplied with a good number of extras and has the potential to be built in such a way that it can be used either a Slaughterbrute or Mutilith Vortex Beast. 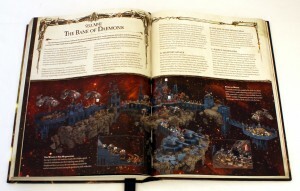 The much anticipated 6th edition boxed game for Warhammer 40,000 is finally here! 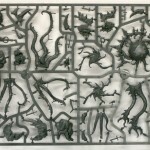 The standard version of Dark Vengeance contains 48 miniatures, all of which are snap-fit plastic models (meaning that the use of glue is optional). The box also contains a mini rulebook, an introductory guide entitled “Dark Vengeance”, two quick reference sheets, assembly instructions and all the dice and templates you’ll need to play the game. All the models in this boxed set are of great quality – the sculpts all being of a standard that would traditionally have been thought of as superior to those expected in an introductory boxed set. The models lack the mono-dimensional aspect of some of the models in the old Assault on Black Reach boxed game – I’m thinking particularly of the Ork Boyz models from the Black Reach box. Games Workshop continue to improve the sense of depth in their plastic kits with the 8 part Hellbrute being built in layers, making this model extremely intricate for a model comprising so few parts. The thought that goes in to doing this is impressive as I’m sure it needs to be considered throughout the design/sculpting process. From a personal perspective, I like about 90% of the models in this boxed set, (and am crazy about 50% of them) just one or two of the Chaos Cultist models don’t work for me, but this is just my opinion and I have spoken others that have no problem at all with these selfsame miniatures. The highlight for me are the Chaos Chosen, these are truly beautiful sculpts. It’s not just about the models however – also included is a mini rulebook that includes the full game rules. The difference between this book and the full Warhammer 40,000 6th edition rulebook is that it doesn’t include all the background and hobby information but more importantly it doesn’t weigh over 2kgs (weighing in at a couple of hundred grams) so is easy to carry around. 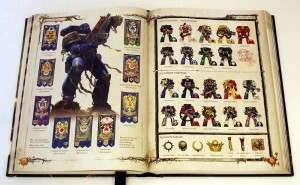 Also included in the boxed set is an introductory guide to Warhammer 40,000, entitled “Dark Vengeance”. This book helps those that find the 156 page mini rulebook a bit intimidating learn to play. It contains 6 missions, the first focusing on individual elements of the game and the last two represent two larger battles that can be played once the basics have been mastered. Above and beyond this are the usual accessories you expect from a Games Workshop boxed game, dice, templates etc but an unexpected gem is the quick reference sheet (of which there are two), these are really useful and will save wear and tear on the rulebook when looking up some of the most commonly used charts and tables. With regard to value for money – some of the models in this boxed set don’t have a direct equivalent available separately so it is difficult to calculate what they might cost if bought individually, but by using logical equivalents – Hellbrute for Dreadnought, Cultists for Imperial Guard etc the models could be valued at approximately £175. Add to this the mini rulebook – worth £10-£15 of anyone’s money and the boxed set represents great value for money. All the models in this boxed set are of great quality – the sculpts all being of a standard that would traditionally have been though of as superior to those expected in an introductory boxed set. Also included is a very handy mini rulebook that is much more portable than the full hardback rulebook. The models could be valued at approximately £175. Add to this the mini rulebook – worth £10-£15 and the boxed set represents great value for money. Well, the long awaited Warhammer 40,000 6th Edition Rulebook has landed at Big Orbit Games and we’ve spent the day pouring over it. As expected, the book is absolutely huge and a single day isn’t anywhere near enough time to read it cover to cover, but if we waited to write a review until we’d finished going through the thing you wouldn’t be reading this until well after release. The 6th edition rule book is 40% thicker than the previous edition, running to 432 pages, all rendered in glorious techni-colour, with loads of new artwork. The book has a black ribbon bookmark to help you keep your place. There seems to be increased use of headings and bold text which makes flicking through to find those all important rules mid-game significantly easier, it certainly helped with the writing of this review. The core game rules (before special rules) only comprise 30 pages – which is nice and concise and will help new players ease themselves into the game. 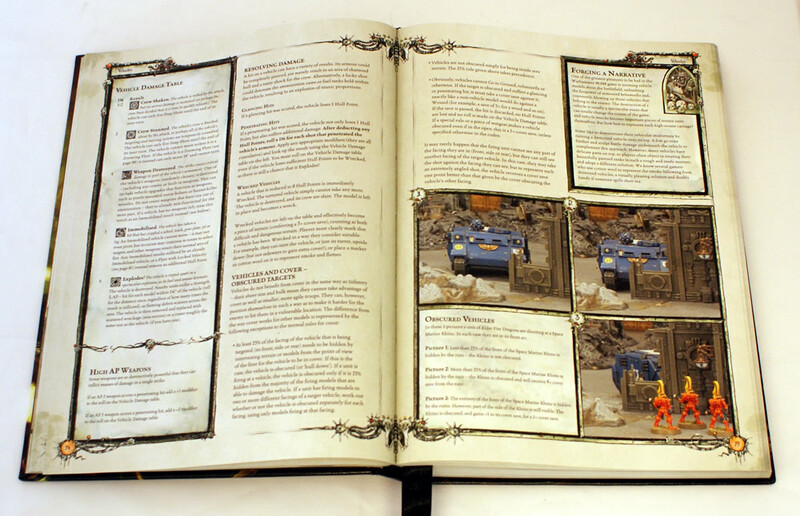 Below is a run down of some of the main changes to the rules in Warhammer 40,000 6th Edition. Though core principles such as unit statistics and the basic turn sequence remain the same, there are some significant changes; fortunately the game remains recognisably Warhammer 40,000. On page 4 is one of the main differences to the core game “You can always check any distance at any time”, basically introducing pre-measuring like in Warhammer Fantasy Battle 8th Edition. The Force Organization Chart (FoC) is still in use, but with the addition of new sections Fortification & Allied Detachment (a reduced FoC for a secondary army attached to the primary one). Fortifications are static defences / weapons that are not included in current Codexes but some are presented in the 6th Edition book and more are promised for White Dwarf later. Allied Detachments must be from a different codex from the primary army, so no using this rule to double the number of a particular unit in your army. There is a complex grid that shows which armies can ally – it is too complex to summarise here. Movement is pretty much the same as in 5th edition with infantry able to move 6″, Jump Infantry 12″ and so on. Unit coherency rules also remain the same. The basic rules for ballistic skill and rolling to hit remains unchanged, as does rolling to wound and using AP to either ignore a save or leaving it unmodified. That said, there are substantial changes to shooting in 6th ed. Saving throws are now taken before wound allocation, wounds are then allocated to the target unit member closest to the unit that it shooting at it. Additionally only models within range and visible to the shooting unit can be removed as casualties. These rules must inevitably result in a screen of standard troopers being used to protect special weapon troopers and unit leaders. A completely new rule is “Snap Fire”, primarily allowing some heavy weapons to shoot on the move and units being charged can also get off shots before they are assaulted, in both these case firing is resolved with a Ballistic Skill of 1, meaning a roll of 6 is required to hit. Rapid Fire weapons can now fire at their maximum range whether they move or not – that said they can still only fire twice at targets up to 12″ away. When shooting at a unit that is only partially in cover a player may choose to “Focus Fire”, targeting only those models that benefit from a lower (or no) cover save. Most grenades can now be thrown up to 8″ in the shooting phase, this is limited to one grenade per unit per turn. There is also a new weapon type “Salvo”, these can fire at maximum range with a full number of shots if the model carrying it doesn’t move, or at half range and with half the number of shots if the model moves. Although many of the core tables, to hit, to wound etc are the same as 5th edition, the assault phase is significantly changed. As in Warhammer Fantasy Battle 8th ed, charge distance is now slightly random, in this case 2D6 inches. A unit can shoot in “Overwatch” if being assaulted, this is a passive ability, basically “Stand and Shoot” for Warhammer 40,000 using the snap fire rules, discussed previously. Units declaring multiple assaults are now deemed to have performed a “Disoriented Charge” and do not get the bonus attack for charging. Individual close-combat weapons now have AP values. Models that are in base-to-base contact with the enemy are removed as casualties before those that are not in base-to-base contact. One of the main changes to the vehicles rules is the introduction of hull points as the vehicle equivalent to wounds – a vehicle reduced to zero hull points is considered wrecked. Consequently the wrecked result has been removed from the vehicle damage table, to be replaced by an increased chance of a crew shaken result ( now on a roll of a 1-2) with all other results shuffling up the table i.e. 3 = Crew Stunned, 4 = Weapon Destroyed, 5 = Immobilised & 6 = Explodes. Most vehicles have 3 hull points but light vehicles, Space Marine Lander Speeders, Eldar War Walkers etc with just 2 hull points and the likes of Space Marine Land Raiders & Necron Monoliths with 4. Another significant change is that most weapons can now be fired most of the time. The classification of vehicle weapons as defensive or primary weapons has been removed, players can now fire all weapons on a vehicle at any time. Moving over 6″ in a turn (i.e. at combat speed) means that only one weapon may be fired at normal ballistic skill, the remainder using the snap fire rule, that keeps cropping up in 6th ed rules, so shooting on these is resolved at ballistic skill 1. Full, and comprehensive rules, for flyers are now in the main rulebook. To accompany the new vehicle damage table (mentioned above), modifiers are also changed on AP2 weapons adding a +1 modifier to rolls on the table, AP1 weapons add +2, AP- no longer results in a -1 modifier. The full strength of blast weapons is now used even if the central hole is not over the vehicle. Disembarking infantry can now be placed up to 6″ from the vehicle access point. There is a new vehicle type, Chariot – the rider may fight any model in base to base contact with the chariot. Psykers now have a Master Level, the level can be either one or two, for each level the psyker gets one warp charge counter, the number of warp charge counters a model has dictates how many psychic abilities a model may use per turn. Another significant change to psychic abilities in 6th edition is the introduction of 5 new psychic disciplines, each has 7 powers and each army has access to different disciplines, if it has access to psychic powers at all. In 6th edition, the HQ model in your army with the highest leadership becomes your Warlord. Warlords get a roll on a one of three tables, there is a choice of Command Traits, Personal Traits or Strategic Traits – these abilities can significantly change the outcome of a battle. For example, the Warlord and his unit may gain the outflank special rule or enemy units may have to use the lowest leadership in a unit within 12″ of the Warlord rather than the highest. There are nearly 30 pages of history and 2-7 pages of background per army. The history section has a 10 page illustrated time-line covering the age of the Imperium. This section is pretty self explanatory, we have a brief introduction followed by 61 pages crammed full of beautifully painted miniatures. This section comprises 29 pages of hobby advice, giving useful advice on building Citadel miniatures to those new to the hobby. I use the word Citadel intentionally here as a couple of the pages are essentially adverts for Games Workshops products, shops, Warhammer World and events, such as Golden Demon. This is section provides details of 5 example missions illustrated with some beautifully produced battlefields – this section contains some real eye candy as well as ideas for novel games, the highlight for me being “Scour the Starfort” (The Bane of Daemons). Following these is a list of more mission ideas and 11 War Zone Traits, special rules that can be applied within games to add variety. This is then followed by a series of entries detailing various Warhammer 40,000 expansions including Apocalypse, Planet Strike and Cities of Death. Finally, in Iconoclasm, there is detailed information on the battles that were fought for the cathedral world of Eydolim – Lots of resources that would allow players to create a rich setting for their games. 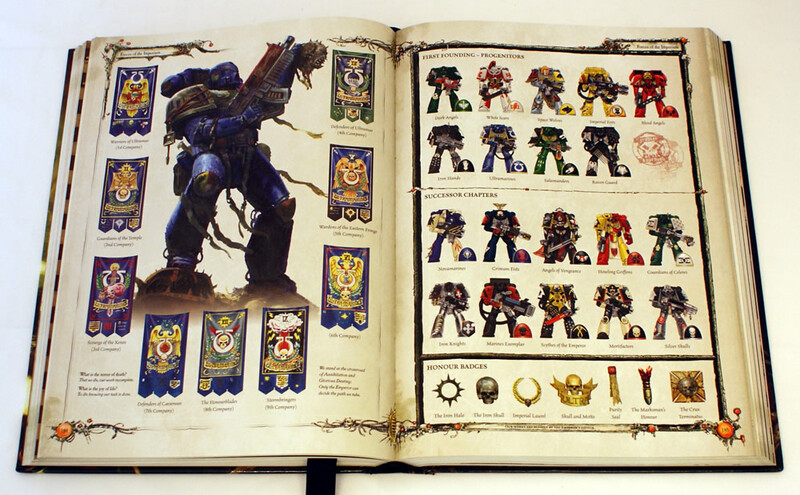 As with most Games Workshop books, the Warhammer 40,000 6th Edition Rulebook is great to look at and well presented. There seems to be increased use of headings and bold text, which makes flicking through to find those all important rules mid-game significantly easier than the previous edition. All in all, you definitely get your £45 worth here. Calling this simply a rulebook does it a disservice – as detailed above the rules only take up the first 130 pages. The remaining 300 pages contain more background, hobby and gaming ideas than a whole series of source books. However, this is potentially a problem, as many would be happy with just a copy of the rules, which could retail at say £20, as they have all the details of the game background in their previous rulebooks / codexes. I do feel that Games Workshop do need to start thinking about breaking away from this case of tome-creep they seem to be suffering from – maybe selling rulebooks and sources books separately. However, I feel certain they won’t as I’m sure they see the rulebook as a great way of selling everything Warhammer 40,000 to their target audience – expect 7th Ed to be at least equally weighty… These books just aren’t of a size that you want to lug around from game to game, many players may want to wait until the 6th edition boxed games has been released to get a pocket sized rule book (assuming one is included) along with a whole host of models – details on what these might be are unknown right now. As with the recent Warhammer 8th Edition Rulebook it could be said that a couple of dozen of these pages are simply advertisements for other Games Workshops products but, at the end of the day, Games Workshop are a business and they are hardly going to recommend that you use a different companies range of paints, for example. With regard to the rules, there have been some very significant changes and the way people play the game will change significantly. There will be winners and losers, but all in all I like the sound of most of the new rules concepts, hull points & warlords particularly – as with any rules changes, individual opinion is likely to hinge on how they impact your particular army. 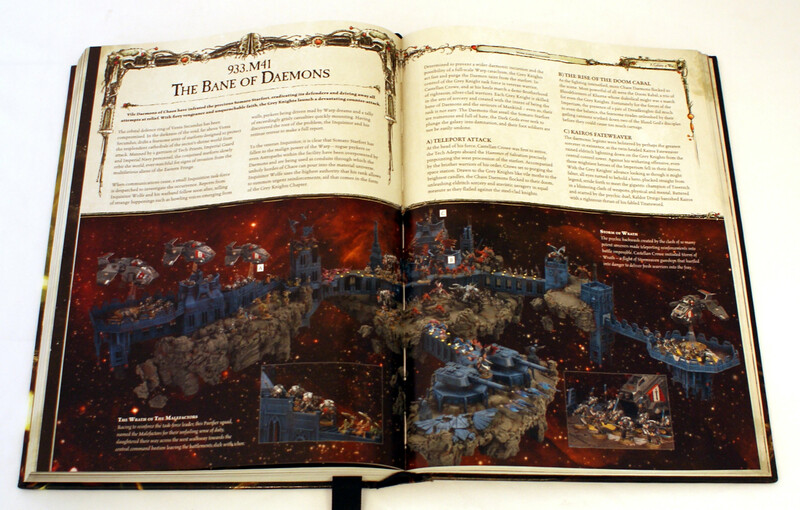 In terms of content and book quality the new Warhammer 40,000 Rulebook cannot be faulted – it is an excellent tome. There have been some very significant rules changes and the way people play the game will change significantly, as with any rules changes, individual opinion is likely to hinge on how they impact your particular army. 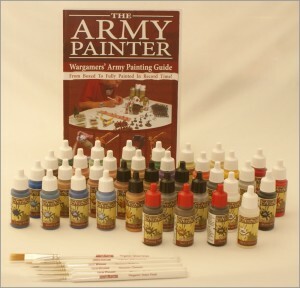 The Army Painter have, for a long time, been saving wargamers time and effort with their range of colour primers and quick shade dips. 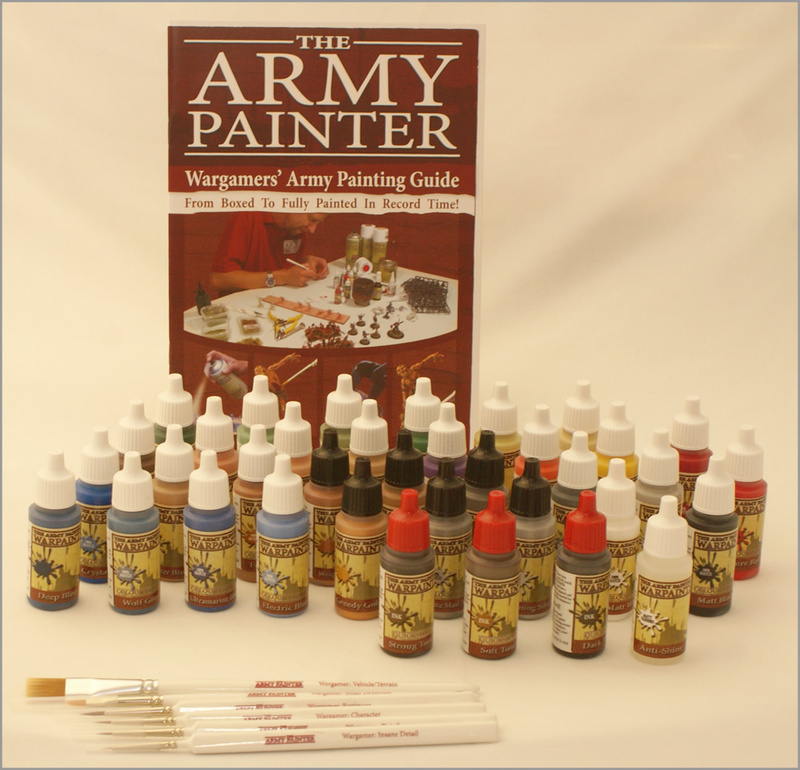 Previously only a limited range of brush-on acrylic paints have been available from The Army Painter in the form of their Wargamer Starter Paint Sets. 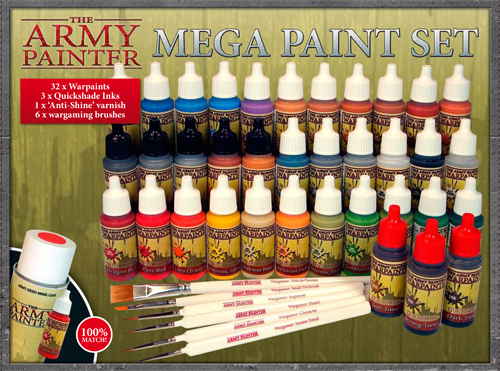 The release of The Army Painter Mega Paint Set changes things, introducing a fuller range of paints, brush-on inks, and a brush-on matt varnish. The set also comes with a broad selection of brushes. The boxed set also contains The Army Painter’s 24 page ‘Wargamers Army Painting guide’ which contains a wide range of guides and articles. 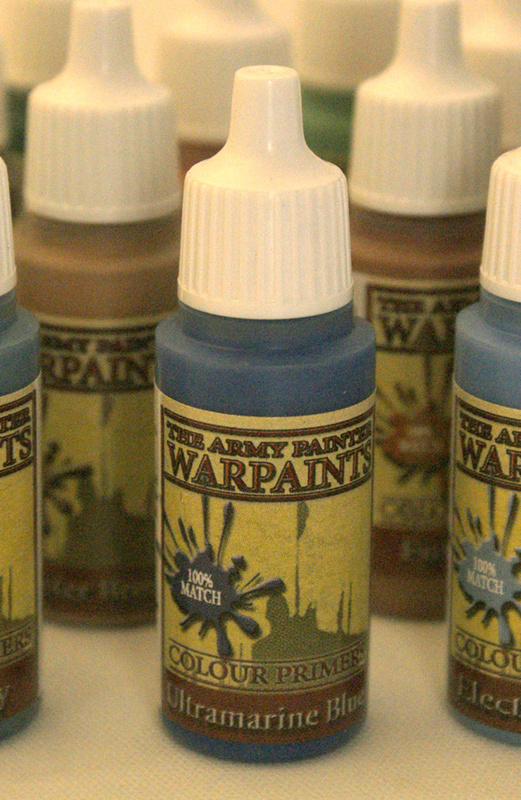 At Big Orbit Games, we have been eagerly awaiting the release of a range of brush-on paints from The Army Painter for some time, being big fans of their range of colour spray primers. The Army Painter have taken account of the popularity of their sprays when forming their brush on paint range with an exact match of each of their spray paints represented in their brush-on range. To my mind this represents one of the best reasons to use army painter paints as it makes touching up any over-painted areas a doddle. On to the paints themselves, The Army Painter have cherry-picked suppliers of each type of paint types, acrylics, metallics & ink washes, this results in a unique range of paints with heavy focus on quality. The acrylics (colours) have a good consistency if well shaken, flowing well and proving a good degree of coverage due to a high concentration of colour pigment. The range of colours available is broad and will meet most hobbyists needs. The inks are not your classic shiny inks, more akin to Games Workshop’s range of washes, these settle into the recesses nicely producing a nice level of graduation. Finally the metallics are produce a convincing metal effect without looking grainy. All in all the quality of the paints speak for themselves. On to the brushes, these are comparable in quality to other mainstream hobby brushes, except the small dry brush which, although easy to use due to the 45 degree angle on the bristles does tend to wear quite quickly. One feature of the army painter brushes that I have always found quite useful is the triangular grip, this makes the brush much easier to control, improving painting results. On to price, I think most of us slightly begrudge spending money on paints and brushes etc, it means less money to spend on models and the £85 RRP of The Army Painter Mega Paint Set seems like quite an investment (although it is only £72.25 – Ed). That said you do get a lot for your money, the brushes alone have an RRP of £21, meaning you get 37 paints, inks & varnishes for the remaining £64, £1.77 each (or £1.51 – Ed), this represents real value for money. The Army Painter’s Mega Paint Set contains a broad selection of quality paints that has the advantage of working seamlessly with The Army Painter’s range of spray paints. It comes with a wide enough range of brushes for most wargamers needs. The Mega Paint Set represents great value for money working out at just £1.77 each, or £1.51 from Big Orbit Games. In Warmachine players assume the role of Warcasters as they lead their armies into battle. Warcasters are impressive warriors that can call on legions of Warjacks (giant coal-fired robots) and squads of hardened warriors to aid them in battle. The core of each Warcaster’s force is comprised of his/her Warjacks. On its own a Warjack is capable of only the most rudimentary actions, but when controlled by a Warcaster its efficiency and deadliness increase dramatically. The careful use of Warjacks can decide a battle for a seasoned Warcaster. 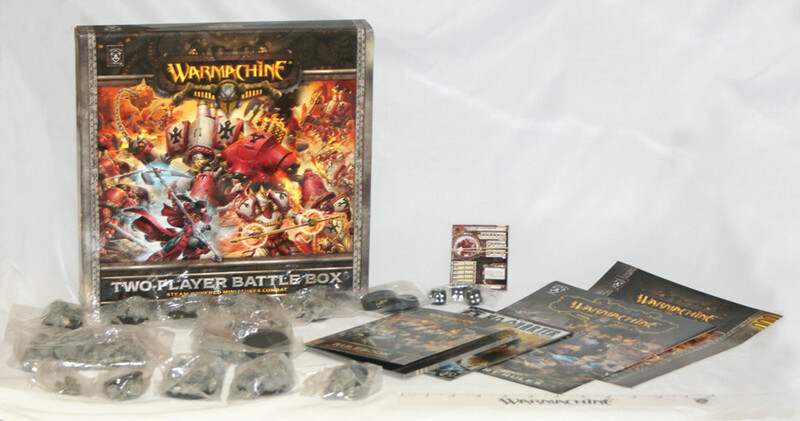 Warmachine is a tabletop miniatures game where players collect, assemble, and paint models representing the various soldiers, warmachines, and creatures in their armies. 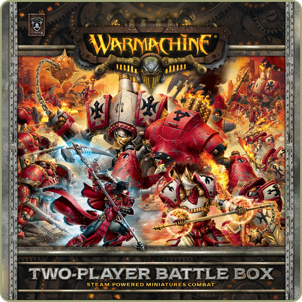 To get new players started with Warmachine, Privateer Press have released the new Warmachine Two Player Battle Box starter set. 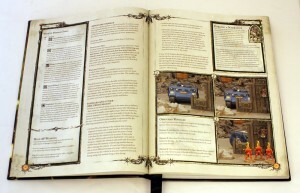 Complete ‘Warmachine Prime MkII’ rules set in a travel-sized, 86 page softback book. An Introduction Guide to the world of Warmachine. The starter also includes 17 plastic Warmachine models, each with it’s own stat card! The Miniatures included in the Two Player Battle Box represent two good sized starter armies for someone that is interested in getting into Warmachine or existing players looking to extend a Khador or Menoth army. Whether you like the miniatures in this boxed set is to some extent a matter of personal taste, I love Khador for example and the miniatures in this set will be added to my Khador army :). Above and beyond considerations of personal taste the models in the boxed set are the same as those that can be bought separately, as such the Warjacks as extensively poseable; waists, shoulders & wrists are all able to be positioned independently. This means that a good degree of variety and character can be built in to each model. Possibly the most impressive thing about the Two Player Battle Box is the great value for money it represents. The models included in this boxed set would retail at approximately £165 if bought separately. That doesn’t include the rulebooks and smattering of gaming accessories included, the rulebook alone would also be worth another £10 or so (the softback full rulebook costing £20). For existing or prospective Khador or Menoth players the decision of whether to buy the Two Player Battle Box or not is a no brainer, buying the models for either army separately would come to more than the asking price of this boxed set and the extra models could then either form the basis of a second army or be sold on / cost split with a friend. Another great thing about the Two Player Battle Box is the 86 page softback rulebook, this is essentially the full Warmachine Prime MkII rulebook without the background information and unit data. This information is not vital and this mini-rulebook is really handy as it is much more portable than the full rulebook. The full rulebook is roughly A4 and weighs over 1 kilo, the mini-rule book is a little smaller than A5 and weighs less than 100 grams. The Two Player Battle Box also includes an Introduction Guide and Quick Start Rules. The Introduction Guide contains information on the Iron Kingdoms (the world of Warmachine) and the various warring factions. This guide also contains a guide to painting the Warjacks included in the boxed set and some cut out gaming accessories. The Quick Start Rules contain a simplified version of the rules of the game; rule areas left out of the Quick Start Rules are the command stats, a number of weapon/model ability rules & some terrain effects. Also found in this boxed set is a mini No Quarter Magazine, this includes several articles including a battle report and a couple of nice hobby guides. 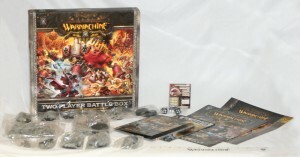 All in all the Warmachine 2 Player Battle Box is a great way for someone that is interested in getting into Warmachine to get started and is also great for Khador or Menoth players to extend an existing army. The miniatures included in this boxed set are of the same high quality as those that can be bought separately and the boxed set represents excellent value for money, the various components costing more than double the cost of this boxed set if bought individually. Finally the icing on the cake is the mini rulebook that contains the full Warmachine Prime MkII rules in a convenient little package. The new edition of the Ogre Kingdoms army book comes in hardback with a very friendly looking blood-splattered ogre on the front cover. Typically the book is split into different sections with suitably orgrish names; Big and Brutish, The Lumbering Hordes, Gathering of Might and The Ogre Kingdoms Army List. This is the background story section, filled with the history of the Great Maw and notable events and characters. The first thing you notice is the artwork – the new Stonehorn and Thundertusk lumbering into battle. Much of the artwork looks great even if some of it is recycled from the either the old book or the old unit packaging. Also in the section there’s a very nice double page full colour map of the Mountains of Mourn with the different ogre tribes and historic battles labelled up. This is a definite upgrade over the map in the previous book which was single page, black and white and not too detailed. More background material follows, the various ogre tribes and their symbols, a timeline of the ogres and great battles of the ogres. Overall there’s a lot of good info in this section to help you get a feel for the army, or to give you pointers on creating your own tribe. A scary looking ogre army accompanies the intro pages to this section which focuses on detailed unit descriptions and special rules. We open with a page of army special rules and there are quite a few changes here over the old book. The big one for me is actually the first up. Ogre charge: Previously Bull Charge (Ogres are just Ogres now, not Ogre Bulls) This is still all about impact hits but now they’re even scarier. No longer ‘any unit of ogres charging more than 6″‘ it now works on any charge… nasty. brand new addition to this rule is that if you roll 10 or more on your charge roll the ogres cause D3 impact hits instead of the normal 1, that’s potentially a lot of free hits. One of the new special weapons is the Chaintrap: This is essentially a bear trap on a chain. SNAP! Next we move to specific character and unit descriptions and predictably start with the biggest and meanest ogres, the Tyrants and other Lord and Hero choices. Many of the stats are the same and it’s only until we get to the Firebellies that we get something new. Firebellies: The new hero choice in the army. A level 1 wizard that uses the lore of fire (duh). Same stats as butchers with a couple of additional special rules including a breath attack. Now onto unit choices, lots of fun new stuff here although Ogres, Ironguts, Leadbelchers, Gorgers, Yhetees and Gnoblars are much the same as before. 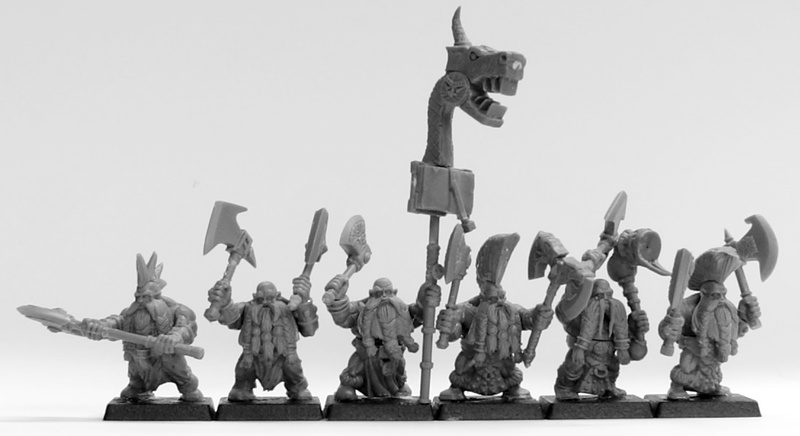 Some of the new stuff includes Sabretusk Packs – Yes they now come in packs, Mournfang Cavalry who have D3 impact hits on the charge and the mighty Ironblaster – Booooom. Who can say no to a cannon that can move and fire. Big creatures now, and they look fun. Stonehorns and Thundertusks – both are good choices and bring something different to the battlefield. Stonehorns with their Earth-shattering Charge and the fact Hunters can use them as mounts making them a mobile bolt thrower and Thundertusks with their Numbing chill and their own shooting attack – a mobile stone thrower – Sphere of Frost-wreathed Ice. Next up are the famous characters, some old, some new. Bragg the Gutsman is a newbie with a nice looking model and some chilling acompanying artwork. His weapon gives him Heroic Killing Blow in any challenge meaning he can take down any sized opponent on a 6 to wound not just man-sized. Ogre gut magic is next although most of it is the same as before but reworded to work with the 8th edition rules. Big Names: No major changes other than Giantbreaker has changed with the lack of Slavegiants in the army. Magic Items: Only 2 pages as they’ve cut down the number of items drastically and upped the points cost of the ones that remain, although they have combined some of the weapons together so they’re quite nasty. This section is a showcase of various figures painted to the usual high standards. Gnoblars finally make an appearance in a photo (yaaay) and theres a double paged spread of Mournfang Cavalry showing off the way the Ogres are perched precariously on the mount as they bounce into battle. The highlights of this section are the Thundertusks and Ironblaster. The Thundertusk looks awesome if only because of the fact the ogres on top look ridiculous throwing bear traps on chains. The Ironblaster looks very nice painted up, maybe not as nice as the Scraplauncher but then again I guess a mobile cannon will appeal to more people in gaming terms than a mobile stone thrower. The most important bit now (apart from maybe special rules) with points values and additional options for each unit. I was quite surprised and very happy as an Ogre player after flicking through this section. Many of the old units have had their points cost reduced to bring them more in line with other armies. This means rather than changing the stats to benefit ogres more in combat (still initiative 2 so usually strike last) they’re giving ogre players the ability to field bigger units to make up for it. Notable mentions of points reductions would be Ogres (previously bulls) are now 5 points less that before, or 8 points less with the Ironfist upgrade. Leadbelchers are down to 7pts less and Maneaters – now a special unit rather than rare – have been reduced by a whopping 30 points whilst retaining the same stats. The last big change is for Yhetees which are now 21 points cheaper, making them much more viable. The last page is reserved for the stats summary page as always and comes with a photocopyable fallen giant template for those shaky moments. Overall the new Warhammer Ogre Kingdoms book is a nice addition to the existing line. It has built on the previous release, adding in some cool new units and accompanying artwork. However the older units aren’t given much love and the artwork for them is mostly recycled from the unit packaging rather than the awesome artwork from the old book. The background content is well written to really inspire you to get into the ogres story and the showcase really highlights how great they can look on the table. The main aim of the book is to obviously confer the rules of the army and any Ogre Kingdoms player will be happy with the new set as it offers a larger variety of units that can fulfil roles the army was previously lacking in and the lower points value of the old units is great for fielding bigger armies, or just to fit the new stuff in. A must have for any Ogre players but a nice read for non-player and a good inspirational point if you’re thinking of starting up your own mighty tribe. Avatars of War have been producing individual metal models for 4 years. The Dwarf Berserkers Regiment is both their first boxed set and their first plastic miniatures. 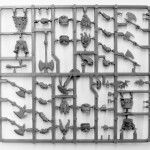 The Dwarf Berserkers Regiment box contains twenty 20mm bases, one regiment movement tray, five trooper sprues and one command sprue, allowing to assemble a 20 figures regiment: 17 troopers, a musician, a standard bearer and a champion. We are reviewing the pre-order special edition box that contains exclusive pieces for the command group. 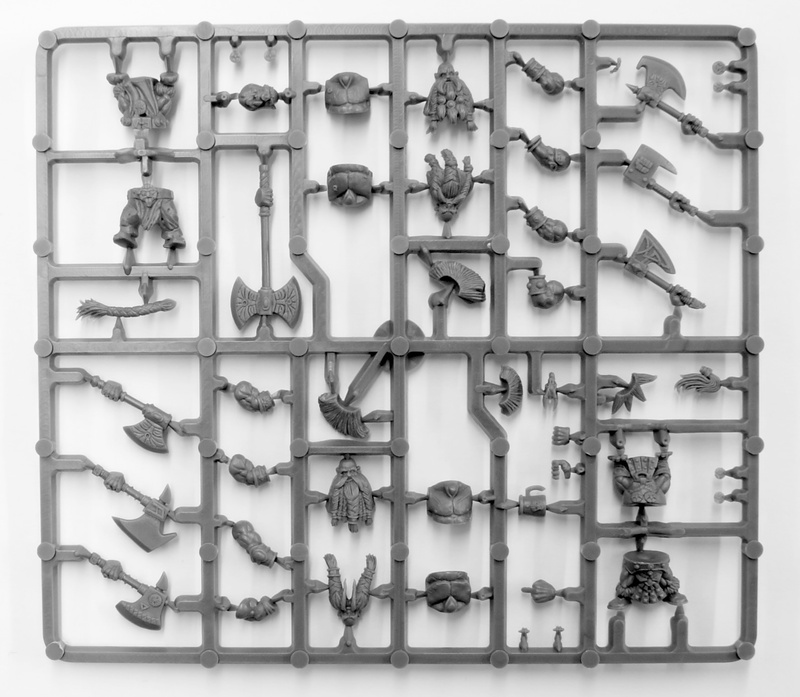 On opening the box I was immediately impressed by the sheer number of components in this kit, the box contains 5 berserker sprues and 1 command sprue, all crammed full of components. It also seemed to me that a huge variety of different miniatures could be built from this kit due to the fact each model seems to be made from at least 7 parts. 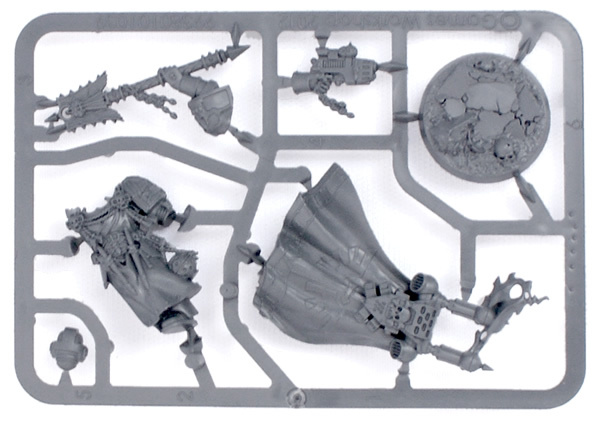 You can see that the various components are very well detailed and that there are a number of accessories on the sprues, beer tankards, hands making rude gestures etc, allowing you to make each berserker your own. There are also some very nice details, rings on the fingers, piercings on torsos and scarring on exposed flesh. Right, time to remove the various parts from the sprue… Ooookay… That was easier said than done. I only have an old pair of clippers on me at the moment, Games Workshop from about 3-4 years ago, the kind with the thick blades. Some of the parts are really tricky to get to using these, one head is only 1-2mm from the frame of the sprue and these clips struggle to get in there. 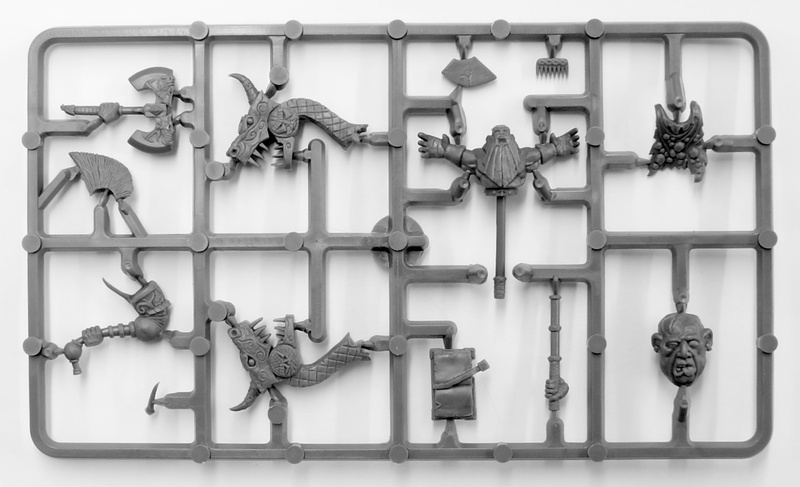 Also one of the pairs of legs, the ones with the runes on the buckle, are attached to the sprue in such a way as to make them tricky to remove. I think this would not be the case with some good thin bladed clippers so if you don’t have any and are thinking of buying this kit it could be time to buy some new ones (Games Workshops new ones are good, as are the Army Painter Clippers). Another thing that is worth highlighting at this point is that some of the extra details are insanely small, this may be the first time that nose to ear chains and piercing have been rendered individually into plastic. Now I applaud Avatars of War for including these in general but they are quite difficult to work with due to their small size. That said, the piercings are the worst to work with and as they add very little to the model (especially as these are rank and file troops) you may as well just not bother with them. Next, cleaning up, I’m a little fanatical about removing mould lines, and other casting defects but I found these models to be pretty clean out of the box, some small areas didn’t even need mould lines removed at all (a very rare occurence in my experience). There was only one significant issue and that was one of the pairs of legs consistently seemed to be cast mis-aligned, this wasn’t too much of an is sue though as this pair of legs had trousers on, so it was just a matter of cutting way some of the plastic to make the fabric folds look natural. OK, I’ve got a selection of cleaned up parts now, time to stick these things together. As these models comprise of at least 7 parts there are a huge variety of ways to build these guys and there is a near infinite range of poses that can be built using this kit. Your unit of berserkers (or Slayers in Warhammer) will not have a single model that looks the same as another. Stand out features are the seperate hands/axes, allowing individual positioning of the wrist joint and optional/switchable mohicans. Top marks! However… There was one part that looked great at first glance but didn’t quite work out, this was the 2-part hand that holds the haft of the double handed axe. Before I tried building the model, I thought “This is great, I can adjust the position of the hand on the haft meaning I can position the arms any way I like!! !” (yes that was 3 exclamation marks – I thought it was that great!). Sadly when you come to build the model you are so limited by having to get clearance from the models beard that there really is little variety that can be achieved. My final comment on sculpt/design is that the banner in the pre-order special edition box is far too elaborate for my tastes and I toned the one I built down. If you build it as shown on the back of the box it would be about 4 bases wide… It is also a little flimsy as the banner pole comes in two parts, simply glued end on end, this will break apart for everyone at some point, no matter how careful you are. I have just two more issues, both concerning the bases. For one they are slotted and the models don’t need slotted bases, meaning they will need to be filled, an un-necessary effort. Also, once I went to use the miniatures in a game I spotted the bases were lightly bigger than the normal 20mm Warhammer Dwarf base. I wanted to use one of my existing dwarf movement trays, as it configured the way I wanted, and the berserkers (or Slayers as I was playing Warhammer after all) wouldn’t fit in the tray, the bases are just under 1mm bigger which makes a big enough difference to cause a problem on a 7 wide frontage. Basically, you may wish to re-base on Warhammer bases. With regard to price these miniatures perform very well, £22 per box, that’s £1.10 per model, including full command. That is cheaper than Games Workshops Dwarf Warriors, less detailed, 3-4 pieces models that come in at £1.25 each, obviously Games Workshop Slayers are much more expensive as they are metal so a comparison would be unfair but the Avatars of War models obviously allows you to field a large squad of slayers for a fraction of the price. 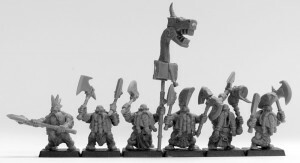 Finally, a lot of people will be planning to use these Dwarf Berserkers as Warhammer Troll Slayers or Giant Slayers but do they look the part? Are they the right scale?. Well stylistically they are just about spot on, they have that warhammer look, as does most of the Avatars of War range. 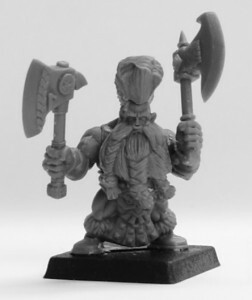 Scale-wise they are maybe 1mm taller, unhelmeted they are only slightly shorter than a Warhammer dwarf wearing a ridged helmet, see pic. 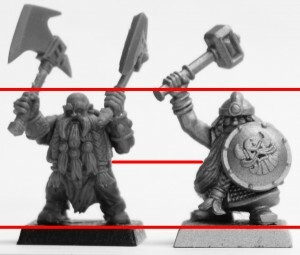 Most of this height seems to come from the legs, see middle line in the picture, the waist line on the Berserker is almost chest hight on the Warhammer Dwarf Warrior. 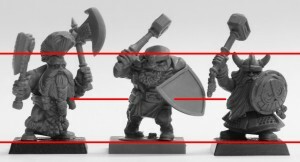 Personally I don’t find this to be too much of an issue as most Warhammer Dwarfs wear mail skirts, so you can’t see their legs and the difference isn’t immediately apparent. 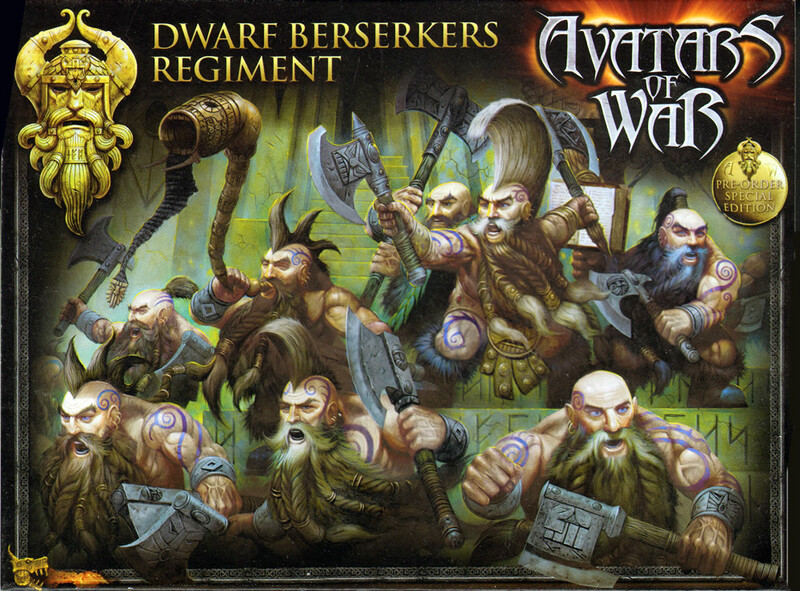 The Avatars of War Dwarf Berserker Regiment box contains some great looking models with excellent detail and can be built in a huge variety of different ways. There are some issues that make building them a little tricky. Cutting some of the parts away from the sprue is a little challenging and some parts are very small. Another issue is that the bases supplied are a different size to Warhammer bases, not an issue if you are not playing Warhammer but if you are it might well mean you need to purchase extra bases. These small issues don’t detract from the over all quality of the models and at just £1.10 each they represent fantastic value for money. 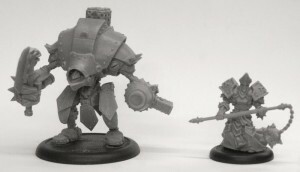 Here is an image of the Avatars of War Berserker next to a Mantic & Warhammer Dwarf. The various horizontal lines are set at the level of the Avatars of War Dwarf. The introduction of resin miniatures by the World’s largest tabletop wargames manufacturer is arguably the most significant event in the hobby this year, with over 100 resin miniatures released in a single day, it is certainly the biggest event of the year. 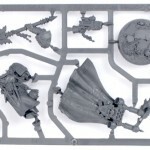 Finecast is the name Games Workshop has given it’s new range of resin miniatures. Many miniatures that were previously produced in metal are now being produced in resin. The reason given by Games Workshop is that resin is easy to work with. Being softer than metal it is easier to cut, and being lighter resin makes the need to pin parts together a thing of the past. The other reason given by Games Workshop is improved miniature quality. So what are the new miniatures like? Resin miniatures are most definitely easier to work with and the detail on the new Finecast miniatures looks very sharp indeed. The image to the right shows a comparison between the axe handle of the new resin (on the left) and the old metal (on the right) Chaos Exalted Hero. The wrapping on the handle of the resin axe certainly seems significantly crisper. Is there any thing else I need to know about resin? As mentioned, resin is easy to work with, but it is also much more delicate than metal and care needs to be taken during building and gaming to ensure that thinner parts aren’t broken. There are also differences in the manufacturing process. Metal moulds come in two parts whereas resin moulds can come in may parts, this means more dynamic components can be created in resin but that there are often more tabs and mould lines on resin models. This means more preparation work is required. Are there any problems with Finecast? Bubbles sometimes occur in resin models, these may be buried deep in the model but, if on the surface, they can result in loss of detail or small areas of the model. The Chaos Exalted Hero we used in the previous example has suffered from this in a few areas, most significantly on his armour just near his head, see pic to the right. The price of these miniatures is going up. Many have voiced disbelief over this but while resin is cheaper than metal, resin moulds have a shorter life than metal ones, meaning they need to be replaced more often, pushing costs up. Can I see a pic of the metal and resin side by side? Detail on the new Finecast range is certainly superior to metal equivalents, it is also easier to work with, although more delicate. There are general issues with resin that impact these miniatures. More model preparation is required and the models are prone to suffering from air bubbles. The miniatures are significantly more expensive, some up to 30% more so, but many have gone up by much less than this headline grabbing figure, and 2 haven’t gone up at all. The price rise is unfortunate as Citadel miniatures were already the most expensive in the tabletop wargaming marketplace. This rise can potentially be justified if the cost of replacing moulds outweighs savings in material costs. However, it does raise the question of whether consumers will pay this premium price and therefore whether the change to resin will work…. Overall, the move to resin is positive. Resin is easier to work with and has great levels of detail. Issues with bubbles etc are found in all resin models and results in the loss of a star as does the increase in price, so, all in all, Citadel Finecast scores…. *Price correct as of 28th May 2011. As requested, here is a photo of the undercoated metal Exalted Hero. Note: graininess on model was caused by undercoat. The Warsphinx/Necroshinx kit (hereafter referred to as the ‘sphinx’) was the worst kept secret of the recent Tomb Kings overhaul. To bring the TK’s up to standard they were always going to get a ‘big guy’ and the sphinx was the logical choice. The fact that they were never mentioned in any previous literature didn’t mean a thing! This review will deal mostly with the sphinx’s aesthetics and how it will play in games rather than its build (dealt with better here). On opening the box it was immediately apparent that this was not a complex kit. 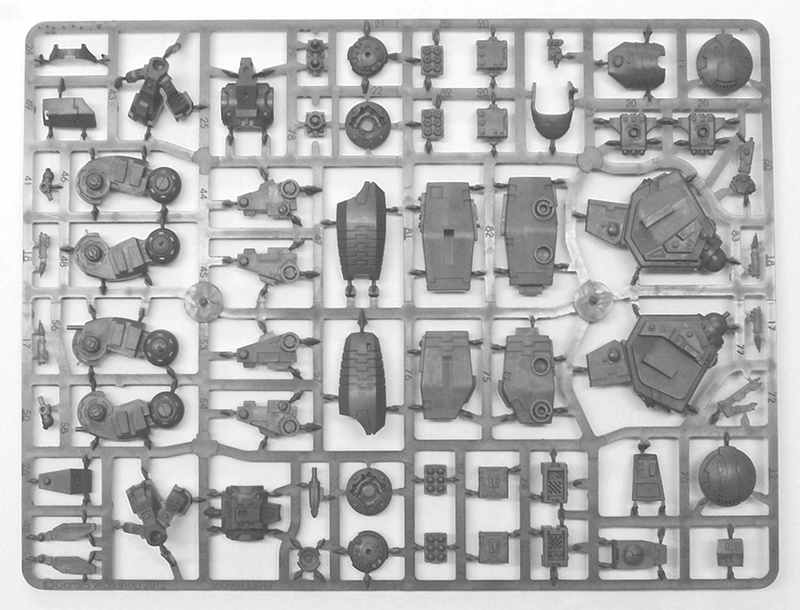 All of the components were contained on just two, albeit dense, sprues. This was accompanied by a much clearer instruction sheet than many of those of late, which included a number of well thought out, logically progressive graphics. When looking at the preview pictures, it was clear to see that, regardless of your choice of build, the model was replete with beautiful detailing that kept its flavour distinctly ‘Tomb King’. Looking at the pictures when the kit was first announced I felt that it would not be possible to build both a Necrosphinx and a Warsphinx from one box, in this I was thankfully proved wrong, see our guide here: Magnetising the Tomb Kings Warphinx/Necrosphinx. An (un)intentional masterstroke on the part of GW? I also freely admit that looking at the images of this kit I was initially disappointed. I don’t know why, or what I had been expecting, but it wasn’t what I was looking at! I have since changed my opinion. Both sphinxs are elegant in their simplicity (but, then as a stone statue, shouldn’t it be?). The model enhances every TK army it graces, not just with enviable battlefield performance, but with its towering stature fitting in amongst the armies’ low profile masses. If they had to have their ‘big guy’ then, better this than the grotesque Carmen Miranda Bone Giant?…… Every time! Regarding in game performance: this is where the Sphinx really comes into its own. With the highest toughness of anything available (8) this fella is not to be trifled with! It has three uses within any TK list. 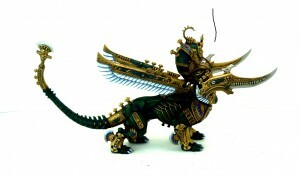 1) Using the Warsphinx as a mount for any Tomb King or Prince. At additional cost to the character and adding a whopping 210 points to the Heroes/Lords allocation I can’t see this as the optimal choice, even though it would make either rider extremely hard to take out! 2) As a rare choice in the ‘Necro’ build mode. This is a ‘toughie’ as the ability to kill absolutely ANYTHING in the game with a lucky dice roll (decapitating strike) and flight, are hard to balance with the fact it’s up against four other very good rare options (I still luuurve those catapults at only 90 points each!) and the fact you might want to keep more points for your ‘special’ choices. This brings us on nicely on to our third and final option…..
3) As a plain, common or garden, Warsphinx. With a howdah full of very ‘killy’ Tomb Guard, Terror, toughness 8, the options for a fiery roar or envenomed sting upgrade and weighing in at a very ‘compact and bijou’ 210 points. At this rate why not take 2 or 3? They come in at well under 50% of your allocation (assuming your playing 2000pts or more) and your opponent will be laying enough bricks to build his own pyramid just thinking of how to deal with them! So, all in all, an overdue but most welcome addition to the Tomb Kings list. Simple, elegant, hard as nails. The sphinx gets a ripping 8/10! *Price correct as of 3rd May 2011.